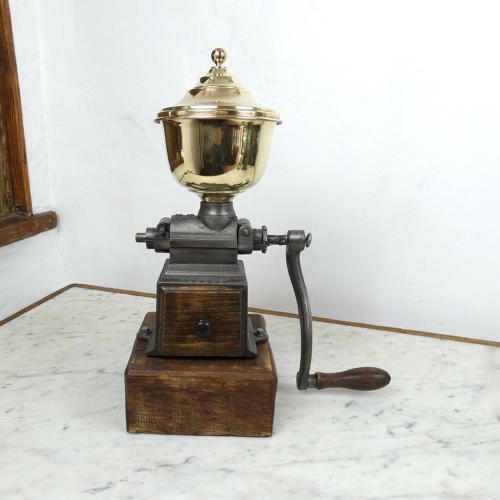 A large, and very unusual, cast iron coffee mill. This piece is made by Peugeot but it is quite different to the majority of mills produced by them and it is a very early example, dating from c.1850. It is marked, in the casting, 'PEUGEOT FRERES BREVETES S.G.D.G'. This is the same company who now make cars. They started making coffee mills in about 1850 and this form would be the earliest style of production. The body is made from cast iron but it all dismantles very easily so it can be cleaned out inside. This can be seen in the various images. The top container, for the coffee beans, is made from brass. This is a replacement, which has been spun as an exact replica of the original. There is a wooden draw to catch the ground beans and the whole thing is mounted on a wooden block. It has 1 fault, that is 1 pin retaining lug has broken, and the top section is missing. (This can be seen in the images.) However this fault does not affect its useability and otherwise is in very good condition. Price includes postage within the U.K. and Western Europe. Shipping to the U.S.A. add £30.